Capricorn Research has always been drawn to the spiritual view of life. It has taken many different paths with twists and turns, but it has had a constant influence. Like most teenagers however I had my atheistic period. At the time I would have sworn that it ran from the age of 14 until my discovery of astrology at 22, but looking back now I realise it only genuinely lasted about 18 months. Being brought up in a fairly strict C of E family setting led me to accept going to church and sunday school as normal and I even attended youth groups where other early adolescents were ” entertained ” by nerdy older teenagers strumming Kum Bay Yah. But even a triple Capricorn ( a sign notorious for slow development and being unfashionable ) has to draw the line somewhere. Capricorns are also extremely pragmatic and will only follow something if it proves to be useful, so as it was becoming clearer that this religious stuff was not only failing to deliver, it was also harming what little street credibility I had, it had to go. In November 1970 however, the release of George Harrison’s ” My Sweet Lord ” made me start to wonder if there was something in it after all. George was always my favourite Beatle, he was the quiet one who was easily the best musician. As the Beatles had only broken up that same year, My Sweet Lord becoming the biggest selling single of 1971 was quite a statement. I did realise that the ” Lord ” referred to by Harrison was not same as the one is previously requested to ” Kum Bay “. I’m not going to say it drove me towards a St Paul like conversion to Hare Krishna, but having one’s musical hero coming out with such a strong statement of allegiance to eastern religion certainly prised open a door that I thought had been firmly locked. But at that stage, I was just happy to have copies of the albums All Things Must Pass and the Concert for Bangladesh, not least because they were triples ( unheard of before ) and therefore a badge of something or other amongst one’s contemporaries. For George Harrison, My Sweet Lord and particularly All Things Must Pass was a coming out in a very big way. It had always been felt that the Beatles interest in all things Indian was mainly driven by George, certainly his connection with the music and spirituality was more genuine and deep rooted than the other three. It still is my belief that after the Dalai Lama, George Harrison has been the one person most responsible for the growth in the west of what Todd Rundgren would later call ” Eastern Intrigue “. As the quiet one in the Beatles its only natural that Harrison would have the Sun in Pisces and Moon in Scorpio, both signs that would tend to hide their light under a bushel. John Lennon had the Sun in Libra, Moon in Aquarius and Aries rising, Paul McCartney has the Sun in Gemini with a Leo Moon so its not surprising that Harrison took a back seat in that band, only managing to sneak in one of his own tracks per album. With that Pisces / Scorpio combination he was a much more introverted character, but the Sun / Moon trine gave him a depth of feeling and compassion and the ability to express it in a way that connected with others. George’s Concert for Bangladesh after the disaster in that country was the first of its kind, not only showing that some rock stars had a global political conscience but were also prepared to sacrifice some of their time energy and money to help. And it was more than a decade before Live Aid. Harrison was a genuine humanitarian. He had Mercury in Aquarius at the very base of his chart, and this seemed to be a fundamental motivation for him. Also this Mercury was part of an exceptionally evolved Grand Trine including Saturn, Uranus and Neptune which also formed a Kite to Pluto. The Uranus / Neptune trine of the early 1940s was the driving force behind the generation that came of age in the 1960s. Their capacity to process revolutionary change along with spiritual aspiration was the reason so many profound changes did occur during the Uranus / Pluto conjunction of the mid 60s. George Harrison’s particular connection with this Uranus / Neptune trine was very strong. His Neptune was also opposite Venus in Pisces an extremely devotional combination. In a way you could say that his Grand Trine had two kites. Interestingly the same could be said of the chart of the Dalai Lama with a harmonious pattern that included the Sun, Moon, Ascendant, Jupiter, Saturn, Uranus and Neptune. 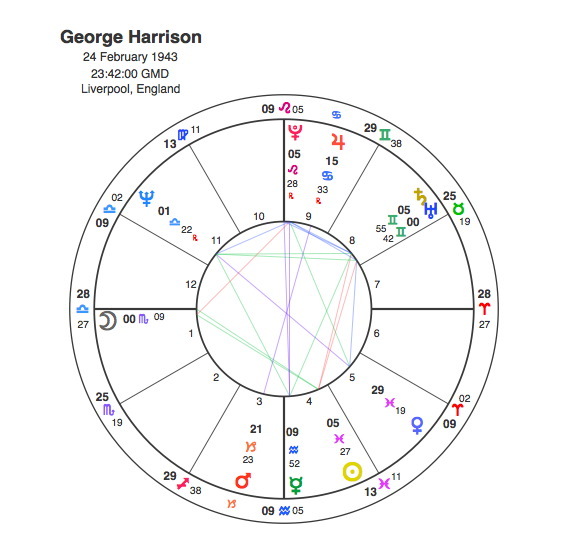 George Harrison also had Mars in Capricorn in the 3rd house opposite to Jupiter in Cancer in the 9th, a clear indication of the capacity and strong desire to communicate lofty concepts of understanding to other people. The first big turning point in George’s Harrison’s life was between 1959 and 61 when with Pluto opposite his Sun he joined The Quarrymen the band that became the Beatles. When the Beatles disbanded in 1970 and Harrison recorded My Sweet Lord and All Things Must Pass Pluto was conjunct his Neptune and opposite his Venus in Pisces. It was the perfect transit for the time. As if these achievements were not enough to be recognised by Capricorn Research’s generation as a true saint, in 1979 Harrison mortgaged his own house in order to fund Monty Python’s Life of Brian, again one of the most important developments in the spiritual growing up of the west. 1982 was a time of change when he withdrew from making albums for a five year period with Pluto conjunct his Ascendant and Moon. The last major transit of his life was Pluto square his Sun and opposite Saturn in 1997 – 8 when he was diagnosed with throat cancer. He died from cancer in November 2001, but as a Pisces with Moon Scorpio and a Grand Trine with all the higher octave planets involved, he would naturally say – All Things Must Pass.